Update: This just won 2nd place in the 's AU catagory for June 2010! Thank you much! Anyways, feel free to check out the fanfic if you like. Just as a warning, InuYasha does swear a lot in it, and he's pretty cruel at first, but with all the cute parts, it's overall a really awesome fic. I've read it twice already and I'm itching to read it again. CX Just can't resist the Brother/Sister Father/Daughter goodness. ^///^ Enjoy! Edit: Here's a [link] to a fanart done by after she saw mine and read the fanfic. You MUST check it out!! It's really sweet and captures the feel of the story well. ^v^ Check out the rest of gallery while you're there! I promise you won't be disappointed. It's cool. U know I read the story and I want to read it again. But I don't remember name of this story. Please help me!!! this is adorable, now I'm curious about the fic. Is this the fic that Inuyasha finds something about Rin? Is it? I think it is! Yep, it is. It's the fic where he is somewhat forced to be her adoptive guardian. Adorable!! Yep it's definitely the one ! XD To me rin looks like kagomae but oh well I STILL THINK ITS CUTE!!!!!!!! Is Sesshomaru in the story???? You'll have to read it and find out. I read the story T_T I cried too many times to count T_T I loved it and I wanted to smash my computer when it finished XD. Thanks so much for introducing it to me, it's actually the first fanfiction I've ever read Thank you! Sure will! Have you ever read "The once and Future Taiyoukai" by ? It's a KagxSessh fanfic, but oohhhhhh ho ho is it good. All of her stuff is awesome. As well as 's stuff. She does some adorable Sesshy/Rin Father daughter stuff. You have to go to fanfic.net to read them all though. Thanks I'll check 'em out!! I can't find the Fanfic!!! Didn't the link work? I clicked it and it still took me there. ?-? Hehehehehe's!! he look's sooo good!!! 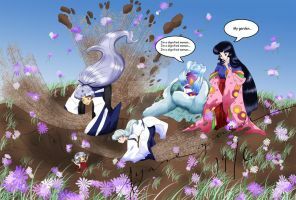 I love Inuyasha!!! I personaly never thought that he would look good with short hair the way I pictured it in my mind, but you made him pull it off!! I will have to read that!!! Sooo cute!!! is this inuyasha? she so adorable! I just read that fic all the way through and I am blown away. I'm STILL thinking about what happened in the second last chapter (the big reveal)! I was like "NO WONDER!! HOLY CRAP!". XDDD After reading that story, this pic just warms my heart. It was awesome wasn't it? Dang, I wanna read it again. It's still my most favorite next to =ReplicantAngel's work. The ending was a shocker indeed! Glad you like my interpretation of Rin and InuYasha for it. I don't think I've ever had so much fun doing fanart for a fic. ^v^ Thanks! Your artwork has won an award from the Feudal Association for the June 2010 term! OOOH! FIERCE! I am seriously reminded of "Aishiteruze Baby"! I loved it! Eeeee! Inuyasha is such a badass!!! Thanks! Haha, I agree. Love him. i rlly like how this picture turned out b/c i could imagine rin and inuyasha more now when i had read that story, and i have to addmit i loved the it!! i was so cute and good, it made me cry several times i have to say! i bawled my eyes out when it ended cause i wanted it to continue, but do u know if rin knew about inuyasha being her daddy in the end? loved it though! Thanks again for the comment! Glad you liked it. but loved it overall and probably will read it again, thanx to u, (since u had suggested it, so thats how i ended up reading it X3 ) sooo Thank u!!! Yeah, I thought it was weird at first too, but after I got over that I just loved it!! I think they were both at an overall good place with the relationship together and with their families in the end, but that's just me. I've had family relationships that were somewhat similar (not too much!) so to me it really ended well. I'm glad you found it as enjoyable as I did! augh, I've been itching to read it again something fierce, but I just haven't had time yet. Some day! You're very welcome!